Alongside Perry Mason, Nero Wolfe is the foremost American fictional detective. Created by Rex Stout, the Wolfe mysteries spanned four decades and have been continued by Robert Goldsborough. Wolfe is larger than life due to his eccentricities. Wolfe loves first-rate food and his one-seventh-of-a-ton figure proves it. He spends four hours every weekday tending to his beloved orchids, drinks copious amounts of beer, balks at working any more than he has to, likes to wear the color yellow, and hates to leave the house. Wolfe is assisted in his investigations by the silver-tongued, hard-hitting Archie Goodwin, his personal secretary and the narrator for all the mysteries. Goodwin is a ladies’ man and has a razor-sharp detecting mind himself, and is often just a small step behind his boss in solving crimes. The Wolfe mysteries are filled with a recurring troupe of colorful characters, including Fritz, Wolfe’s personal chef; Inspector Cramer, a perpetually aggrieved cop who grudgingly works with Wolfe and Goodwin and respects them more than he’d ever admit; and a motley collection of cops, private eyes, and other allies. The Wolfe books are classics with a very distinct, colorful style that sets them apart from all imitators and would-be successors. It’s this uniqueness that makes them great, but it’s also a difficult quality to replicate in adaptations. Wolfe has been featured in a mediocre American radio series, an excellent Canadian radio series, and a terrific, relatively recent television series with Maury Chaykin and Timothy Hutton. Recently, two other TV series based on the Wolfe mysteries have been released on DVD. Neither is quite faithful to the spirit and tone of the original, but one manages to be frequently delightful (albeit often flawed), while the other is watered down to the point that it loses the entire flavor of its inspiration. Rex Stout’s Nero Wolfe: The Complete Series contains the feature-length pilot movie for a series that never came to fruition, based on The Doorbell Rang, a tale inspired by Stout’s real-life frustration with the tactics and management of the FBI. It’s a solid adaptation that never really sparkles. The rest of the DVD set contains the fourteen-episode 1981 series featuring a different cast, led by William Conrad as Wolfe and Lee Horsley as Archie. The show tries to appeal to a broader audience by smoothing down Wolfe’s rough edges. Instead of being proudly misogynistic, Conrad’s Wolfe is only occasionally grumpy and at times is practically jolly. When Conrad’s Wolfe hugs a man who stole from him and later inadvertently helps him, or when he reflects on a woman he was once infatuated with, it becomes clear that this softer version is less interesting and surprisingly less endearing than Stout’s original creation. Worse still is the treatment of Archie. Stripped of his role as narrator, Archie’s personality has been rendered bland. This is evident in the way he dresses: instead of period suits, blue jeans reduce his screen persona further. Inspector Cramer’s crusty personality is also more milquetoast, and other colorful characters are muted to the point of becoming pallid. Interestingly, orchid tender extraordinaire Theodore Horstmann, often mentioned but rarely speaking in the original stories, is promoted to a main cast member, though little effort is made to develop his character. Additionally, the superb P.I. Saul Panzer takes the role of the other three members of the trio of investigators who often help Wolfe, though his own character has absorbed some of the less attractive attributes of his peers Fred Durkin and Orrie Cather and is substantially dumbed down from genius operator to gauche comic relief with a love of pancakes and no appreciation for fine food. Many of the episodes are based on Stout’s original stories, but one hour is not enough to tell the novels’ stories properly. Some episodes use a Stout title but an original plot while others are new creations, though few of them stand out in any way other than their sheer banality. In cases where the killer has been changed, insufficient clues have been inserted to make for fair-play detection on the part of the viewer. At times, the tacked-on happy endings reek of treacle. Ultimately, Stout’s books succeeded because they were full of personality. The characters of Wolfe and Goodwin were so well crafted that I personally would have been content just to read a book consisting of dinner-table conversation between the two. They were larger than life and eminently engaging. In contrast, the characters in the 1981 series take immortal individuals who are practically four-dimensional and crush them down to one dimension. Every quirk and feature of Wolfe’s personality has been diminished. In the books, Wolfe clings to his set routine. If he interrupts his daily orchid time or even leaves the house on a case, it’s Stout’s way of telling us that the feces is no longer figurative, so to speak. In the 1981 series, Wolfe breaks his own rules at least once an episode, so the rules are no longer special, and in a way, neither is he. The 1981 series is a case of sloppy cooking. If one were to try to replicate a seafood dish using frozen fish instead of just-caught from the sea, replacing saffron with MSG, inserting canned vegetables instead of fresh, omitting the shrimp, throwing in non-dairy creamer instead of actual cream, and microwaving the ingredients instead of simmering them in a skillet, the result would be remarkably like the 1981 Nero Wolfe. The show renders the source material flat and generic. In order to be lovable, a creative work has to be distinctive in some way. When it’s a cookie-cutter crime drama, just like countless others on TV, it never descends into awfulness, just averageness. Someone unfamiliar with the Stout stories might find them more enjoyable than a staunch Stout fan such as I, who was deeply disappointed in a show that doesn’t try particularly hard to capture the magic of its namesake. In contrast, the 2012 Italian adaptation of the Nero Wolfe mysteries takes a ton of liberties with the source material, and yet it works much more than it doesn’t. In this series, one of Wolfe and Goodwin’s cases (later implied to be the case central to The Doorbell Rang) has gotten them on the bad side of the FBI, and the government has suggested that the detectives would be better off living overseas for a while. And so, the two transplant themselves to Italy, and Wolfe buys a house and remodels it as close to his legendary New York brownstone as possible. Once abroad, the pair speak Italian even in private and almost never lapse back into English. The other members of the cast are obviously not the original supporting characters, but they are clearly inspired by the originals. Nanni Laghi (Andy Luotto) is the new cook, replacing Fritz Brenner. Rosa Petrini (Giulia Bevilacqua) is an ambitious reporter, a combination of newspaperman Lon Cohen and Lily Rowan in her first few appearances, when she was an annoyance to Archie before becoming his love interest. The Italian police are a lot closer to their American counterparts than any of the other new characters, and the assistant investigator once again takes the role of comic relief. The Italian Nero Wolfe consists of eight episodes, each based on a classic novel: Fer-de-Lance, Champagne for One, The Golden Spiders, The Rubber Band, Gambit, If Death Ever Slept, The Red Box, and Over My Dead Body. Most of the adaptations are 80 to 90 percent faithful to the source material, though a couple of them alter the ending (such as by adding a killer or making the guilty more sympathetic), adding a subplot, or by making Wolfe or Archie say something that Stout’s original creations would never say. Francesco Pannofino is a grumbling, crusty Wolfe, and though he’s substantially changed from the source material, there’s a lot to appreciate about his portrayal. Pietro Sermonti’s Archie is less successful: his trademark wit, humor, and mischievousness have been diluted, making him often more hapless than competent, though he does have several good moments. In the books, it’s clear that either Archie’s always in control of the situation, or he soon will be. In this series, Archie’s often trumped by circumstances or Rosa. Nevertheless, the quality of this series is pretty high. The art direction and settings are definitely attractive, and this is a case where a different cultural approach to an American source material can reap intriguing dividends. 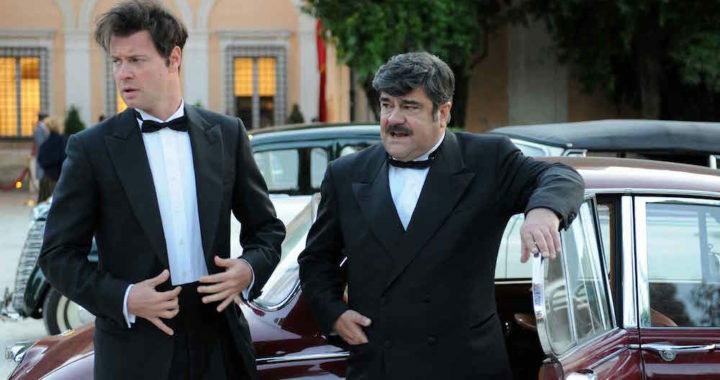 No adaptation of a classic can satisfy the entirety of an intense fan base, but of these two television takes on the Nero Wolfe mysteries, the 2012 Italian-language version captures a slightly different spirit from the originals, but makes for a far more enjoyable viewing experience.